The first time I made French-Onion Soup, I was about three years old and helping one of my uncles in the kitchen. I've had a lot of time to experiment and play around - this is my own simplified version of a classic. Special note about this dish: MAKE THIS DISH THE DAY BEFORE YOU PLAN TO SERVE IT! The collagen-proteins in the broth break down after being heated and then cooled. This packs a ton of flavor. Don’t believe me? Have a "test bowl" of the soup on the first day, then pop the rest of the batch into the fridge and try it again the next day. This recipe serves (four) one-cup portions, but I like to serve it with sandwich and salad so I cut back the soup-portions to a half-cup or two-thirds of a cup for six to eight servings. Choose your crock/oven-safe bowl sizes accordingly. *Do not attempt to remove the butter. Butter IS the richness that makes this soup so appealing. It pulls all the flavors together. If the dish doesn’t taste right to you before you serve it, try adding a bit more butter. Most of that time, that’s what’s off with the dish – keep that in mind if you use butter substitutes. **This recipe is a bit heavy on the onions, for my tastes, so I like to use 1 medium and 1 small onion. I also like to use spicier onions in this dish, going crazy with the pepper too - I love the heat that it brings to the dish but traditional recipes call for sweet onion. *** I go heavy on thyme – it’s one of my favorite herbs. Thyme is traditional to French Onion Soup but, if you want to experiment with flavors, you can swap thyme for another herb – rosemary, oregano, whatever you like that goes well with onions and beef. **** Per the standard rules of cooking with wine, I never cook with something I wouldn’t drink. Paraphrasing Alton Brown here - but if it isn’t a good drink, it won’t make good eats. Price also doesn't matter. What's important, use a wine that you like. I have yet to find a dry sherry that I like. I suggest using any of your favorite DRY white wines when you first make this and then experimenting. My all-time favorite alcohol to use for this recipe is ale. Guinness is my usual, but I love experimenting with any bready beer. (I also refresh the beer flavor when reheating the soup on the second day but I'm an ale-drinking and love the flavor). 1. Heat a deep pot over medium heat. Heat oil and butter in pot. Add onions, along with 1 tsp of thyme and a pinch of salt – be careful not to overdo the salt. This dish can get too salty very quickly and you can always add more salt at the end. 2. Reduce heat, cooking onions low and slow, for about 45 minutes. I like to keep them covered with a lid for the first twenty minutes or so. Then, I remove the lid and allowing the steam to vent for the last half of the cooking process. Stir occasionally, and cook until the onions are golden brown (caramel colored). 3. Use sherry (or substitute) to deglaze the pot. Add beef stock, another tsp of thyme, and bay leaf. Cover and bring to a boil. 4. Remove bay leaf once soup reaches a boil. Salt and pepper to taste (I like to go heavy on freshly cracked pepper). 5. Put the lid on the pot and remove from heat. Let it cool for a bit, then pop it in the fridge overnight. You can skip this step if you want to eat the soup immediately but I suggest holding off and making this dish the night before you plan to eat it. It’s worth the wait. 6. Next day, preheat your broiler to high. Pull the soup from the fridge and pop it back on the stove. Return to a boil. 7. While you wait on the soup to heat, toast your bread on both sides. Leave the broiler on! 8. Once soup reaches a boil, taste and adjust flavors – I usually add a tiny bit more butter (1/2 tsp) and a ton of fresh-cracked pepper. Maybe a bit of salt or a dash of wine (I store wine by “recorking” with Vacu Vin Wine Savers). 9. Arrange oven-safe soup-bowls or crocks on a sturdy baking sheet/pan. Ladle soup into bowls/crocks. 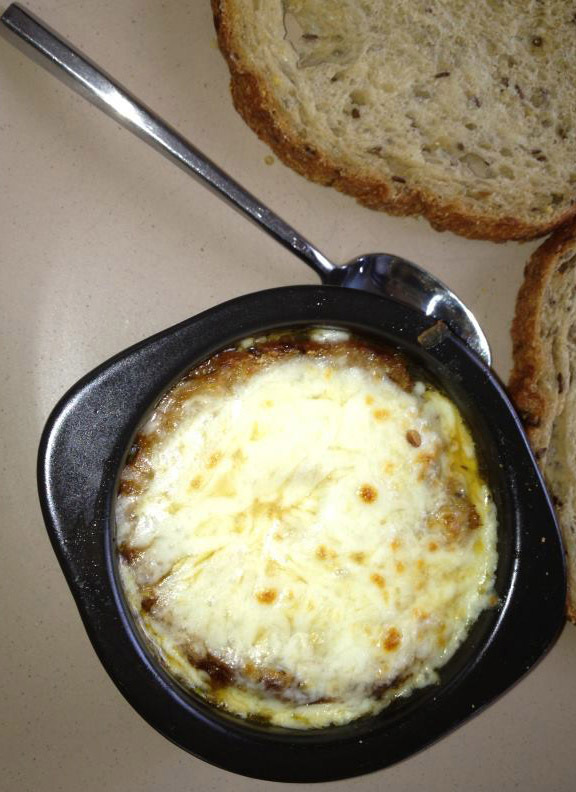 Float the toasted bread on top of soup and cover toast with a mound of cheese. Sprinkle some chopped fresh thyme on top of cheese. Place under broiler until cheese melts and bubbles. Let it cool on top of the stove for a couple minutes before serving. This pairs well with vinaigrette-tossed salads. I hope you enjoy it Crystal!